26 photos, most taken in 2015 of this steel barque, built in England in 1888 and now preserved in Stockholm. Also some of the classic ferries built in the early 20th century to serve the Stockholm archipelago and still in service. 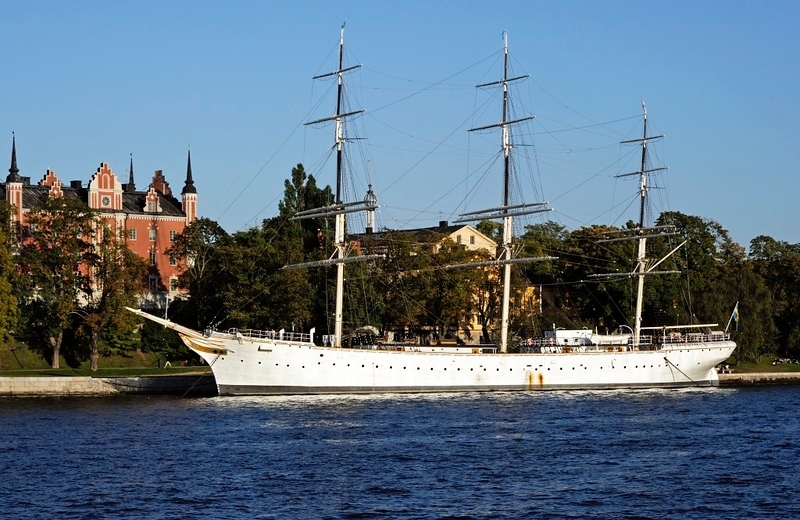 af Chapman, Stockholm, Sun 7 September 2014. This full rigged steel sailing ship was built in Whitehaven in 1888. It was named Dunboyne, after the town in County Meath. The Royal Swedish Navy bought the ship in 1923 and used it as a sail training ship before it became a barracks. It is now a youth hostel. Vice Admiral Fredrik Henrik af Chapman (1721 - 1808) was a Swedish shipbuilder of English descent. He is considered to be the first naval architect. He was ennobled as "af Chapman" in 1772.